High TRIGLYCERIDES | Standard Medications Treatments - Full of Health Inc. Please note that this website is not intended for "most people." It is written for those who want to stand out in self-health care. If you are such a person, we strongly advise that you give serious thought to all of the suggestions about how to improve you blood lipid profile, triglycerides in particular. If you are tempted to think the suggestions are too complicated or too simplistic, or even biased, we assure you they are not. Source: Panel's ties to drugmakers not cited in new cholesterol guidelines. Newsday.com. Prescription medications that treat patients with high triglyceride levels are usually prescribed - if, after sincere efforts of diet and exercise have been tried, triglycerides are still elevated. And your doctor will tell you there is nothing to worry about side effects which are - according to pharmaceutical companies - minor and in any event more acceptable than high triglycerides levels. Triglycerides are lowered modestly and only a small increase in HDL-"good" cholesterol can occur with statins. LDL-"bad" cholesterol level above 3 mmol/L, or 116 mg/dL. This popular antihyperlipidemic, non-statin prescription drug has been used to lower cholesterol since 1981. However, in January 1998, it was also approved - by the FDA's Center for Drug Evaluation and Research - for reducing the risk of coronary heart disease in adult patients with lipid abnormalities, including high elevations of serum triglyceride levels. Lopid, a registered trademark of Pfizer, Inc., is distributed by Parke-Davis, a division of Pfizer Inc.
TriCor is a registered trademark of Abott Laboratories and Groupe Fournier. The drug is sold in over 77 countries world-wide under the primary brand names Lipanthyl® and Lipidil®. There many nicotinic acid derivatives available on the market today in tablet, capsule or solution form. Some commonly used brand names are: Niacor, Niaspan, Nicolar, Nicotinex Elixir, Slo-Niacin (in the US) and Novo-Niacin (in Canada). A rise in HDL-"good" cholesterol is only small, significantly smaller than seen after administration of fibrates, and not consistent. belching, often called a "fish burp"
If, however, your triglycerides remain high despite statin therapy, your doctor may consider adding niacin to bring them into the normal range (less than 150 mg/dL, or 1.7 mmol/L). High triglycerides may be caused by other disorders, such as type 2 diabetes, alcoholism, hypothyroidism, Cushing’s syndrome, liver disease, uremia, dysglobulinemia, or nephrotic syndrome. Once the underlying disorder is identified and treated, triglyceride levels often decrease. * The testimonial above has been presented as a true story. However, it has not been reviewed by Full of Health Inc., and is the sole opinion of the listed individual. The only way to find out whether nutritional triglyceride reduction can work for you is for you to try it. 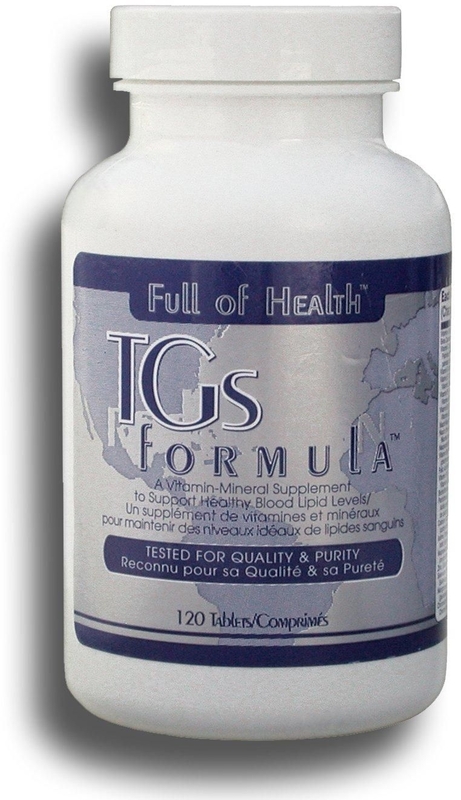 Then you can find out what others learned years ago: Triglyceride Reduction TGs Formula can control the level of blood fats, such as triglycerides, and reduce risk for heart attack or stroke safely. This all-natural combination of 70 nutrients and phytonutrients (plant nutrients) not only keeps your blood fats in check (as drugs do), but actually helps your body rebuild the organs and systems that control your blood lipids - without side effects. ** Metafolin® is a registered trademark of Merck KGaA, Darmstadt, Germany. *** Sytrinol® is a proprietary extract of Plymethoxylated flavones and tocotrienols from citrus and palm fruits. **** Cinnulin PF® is a registered trademark of Integrity Nutraceuticals International. Medical establishments must place the patient foremost and to understand that doing "no harm" should be the only treatment. We recommend nutritional measures aimed at controlling elevated blood triglycerides. And we do so on the basis of evidence gained from observations in hundreds of users of our Triglyceride Reduction TGs Formula supported by basic dietary and lifestyle modifications. Example No. 1:Many doctors have for years been recommending the lowering of blood cholesterol because this would probably help prevent coronary heart disease, but this was not "proved" until 1984, and then for only a selected category of patient. Example No. 2:The formal proof on the health benefits of exercise is not yet in, yet practically all physicians recommend it. And they are right to do so, because the probable evidence is excellent. © 2001-2013 Reduce High Triglycerides.com. Lowering High Triglycerides Naturally with Triglyceride Reduction TGs Formula: A Drug-Free Approach to Elevated Blood Triglycerides. All rights reserved worldwide. This document may not be copied in part or full without express written permission from the publisher. The information on lowering high triglycerides provided herein is a general overview on this topic and may not apply to everyone, therefore, it should not be used for diagnosis or treatment of any medical condition. While reasonable effort has been made to ensure the accuracy of the information on reducing elevated triglycerides and increasing low HDL cholesterol naturally, Full of Health, Inc. assumes no responsibility for errors or omissions, or for damages resulting from use of the high triglyceride information herein.